Your team will soar with Ziptrek! The benefits of teambuilding activities have been repeatedly shown, especially when they are done outdoors, in the open air, away from daily stressors. Group activities allow for colleagues to engage in friendly competition in a fun environment, far from the everyday routine. Teambuilding does wonders for a group’s spirit, cooperation, communication and cohesion. Ziptrek gives you the chance to do just that! You and your team, free from gravity, will zoom down the 5 tandem ziplines – with two of them stretching over a kilometer long – at speeds that will send your heart racing. 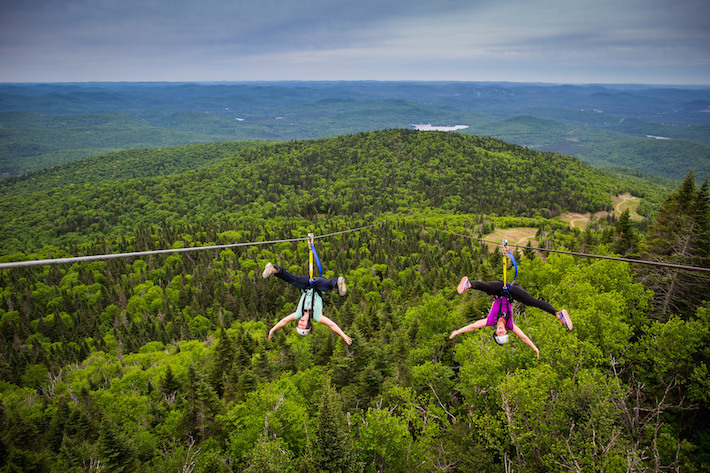 From Tremblant’s mountain summit, all the way down to the pedestrian village nestled at its foot, you can experience the thrill and excitement of flying as you soar high above the treetops! Explore nature as you dash past bear, wolf and deer habitat. Ziptrek’s experienced professional guides will guide you through the journey and ponctuate it with historical facts about Tremblant and the area’s diverse flora and fauna. Hiking trails, and viewing platforms mark the path and provide access to the various ziplines. Three full hours of emotional highs, thrills, adrenaline and pure fun await you. As your teammates learn to help and cheer each other on, they solidify their bonds and their motivation to work together to achieve common goals increases accordingly. A winning combination for any teambuilding activity! With departures every 20 minutes for groups of 8 to 10 people, Ziptrek can accommodate up to 294 people per day. Note that special group rates are available. In low season, for example, rates start at $102 per person, for groups of 20 adults or more, and $95, for groups of 40 people or more. In high season, rates start at $110 per person, for 20 people or more, and $103 per person, for 40 people or more. We strongly recommend that you book your space ahead of time to ensure you do not miss out on this exhilarating adventure while visiting Tremblant! To make the most of your upcoming adventure, why not come in the Spring, when bright green leaves are budding everywhere, or in the Fall, when leaves turn a myriad of colors? In any case, you will need to hold your breath until May 16, 2015 when Ziptrek reopens for the summer season. Ziptrek is only but one example of the many group activities available at Tremblant during the summer season. Your corporate meetings will take on a new spin when combined with a targeted creative endeavour. Make sure to read our next blog post, highlighting 4 more summer teambuilding activity options available at Tremblant!